Event Management is one of the fastest growing sectors in India. 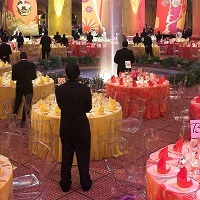 The Event Management Industry is at its initial stages. It has opened the doors to various exciting job opportunities. Celebrities, Government Departments, and even common people keep organizing events for various purposes. Thus, there is no dearth of job opportunities in this sector. Those who aspire to work in this growing industry must possess a vibrant personality and good communication skills. We undertake hiring for job positions including Anchors, Event Coordinators, Event Managers, and Hosts.